On the 1st November, Les Baillie and his bee team took part in the Partnering for Change event at the Pierhead in Cardiff Bay. The exhibition showcased examples of projects being undertaken across our region by staff and students from all three Colleges of the University. These ranged from our own engagement with community groups investigating the antibacterial properties of honey and greening the campus, to our new National Software Academy in Newport. And from geocaching with a Merthyr Tydfil men’s group, to dancing with young Welsh learners in our region’s primary schools! Importantly, as well as celebrating the many and varied partnerships already underway, the event was an opportunity to ask how the general public wanted to see the University engage with the emerging Cardiff Capital Region. The exhibition was launched by the School of Geography and Planning’s Professor Gillian Bristow, who is both Dean of Research in the College of Arts, Humanities and Social Sciences, and Director of the University’s City Region Exchange. 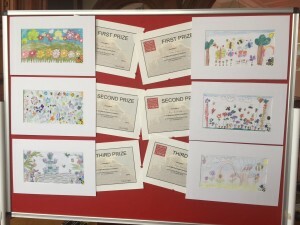 As part of the event we ran a competition with two local primary schools, Mount Stuart and Grangetown who were tasked with designing “my beautiful bee garden“. The winning posters were displayed on an exhibition board at the event.